question - how can we get this printed on heavy duty very large print outs? I don't havea printer that can do huge print outs. I also double this question because I have some digital photos I want to frame very large for my parents before thanksgiving - where ca nI go? How large? For poster sized prints and the like you can go through a camera shop like Ritz/Kitz/Wolf (whatever that franchise is called in your area) or the photo labs at Wal-Mart, K-Mart, or Target, but an independent photo lab, either walk-in or through the mail/online, would likely do a better job at a more reasonable price. I would like to get it framed also...thanks for the help. I wonder if I should do frameusa.com and get it printed - them framed myself (?). Thanks for sharing MHEADROOM, For those who went to kinkos, wallmart how did you store your sign is it thru usb drive sorry for the silly question. I had mine on an SD card (what I had handy at work when I discovered this thread, and I printed on the way home). You could use USB stick, CD-R, or any other camera media (SD, xD, CF, MS). I'm not sure they accept DVD-R. I would like to request the XBR logo. Hey Bro I made a donation for the great work!! I could request a few more? Is there any way you could print them for use in back light boxes? I guess you would pick the higher resolutions for that? Thanks. You would want to have them printed on mylar for back light use... I'd use the high-res version for printing regardless size. First of all props for all your efforts! Nicely done. I registered on your site to get some logos and i was hoping to see this one up. No luck, so i would like to do a request, just like the one on the picture. Thanks. Don't know if anyone's tried this for there signs, but I've used this ink jet media for photographs, and it's incredible stuff. Would also look good back lit. Also, I saw someone post that hey can't print extra large- check out adorama. They're very reasonable and very fast. I'm a photographer and had 5 classes worth of prints done for ~130, and received them, cross country mind you, in less than a week. Plus, the 400+ prints only cost 3.95 to ship from NY all the way to Cali. These signs are really incredible. Here's a few requests- take your time. 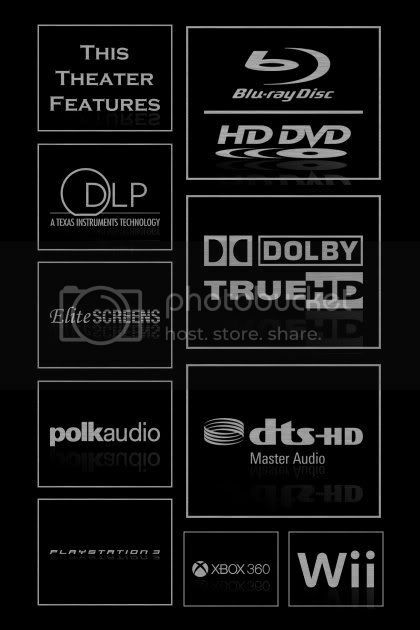 SACD, Silverstone (HTPC Accessories), InFocus, Lucasfilm, MTX. Awesome work man!! !I'll toss in a couple requests and will be making a donation as well! by the way great works, and thank you in advance, please grant my request at your convinience....HAPPY HOLIDAYS. and when you are done can I just right click in the picture and save it to my usb stick and bring it to Kinkos or wal-mart great work. I would like to send you a small donation sorry I don't have paypal. I will be glad to sent you via mail. just pm me your address. 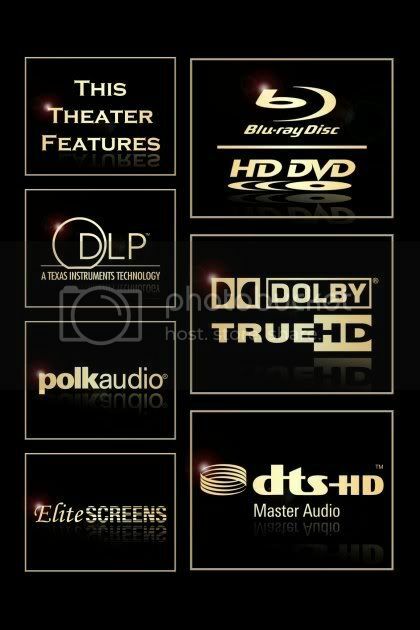 *NOTE If it is not too much to ask in the REEL GRAPHICS can you add our names in 4 corners? PETER, RUTH, BIANCA and BRIAN? If it is too much work don't worry just the reel will do I just thought it will pleased my family when they see their name in there. If I right click and save an image what is the size in inches? 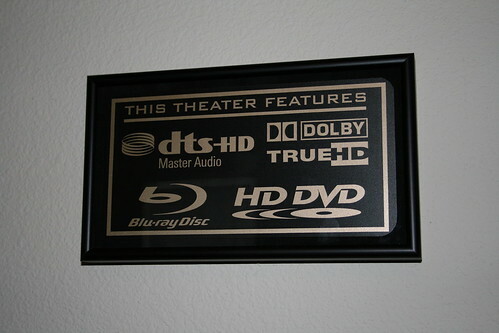 Also are there any signs that we can get that have multiple images on one like the one mtommy79 above mentions (but I don't need the HD-DVD one) : This Theater Features Dolby Digital TrueHD, DTS-MA, THX. Just wanted to say thanks for making the pics and making them available to us. Had a few 8" x 10" pictures printed at Costco. Bought some frames at Michael's. Looks good for a $30 project. Thanks again! Those look great. I did 5 pictures and frames at WalMart for around $30... great project for anyone with a dedicated room.... one of those little detail type touches that really make a room pop! Is that real or faux brick? If real, how did you mount? Any worries about any damage being present if you move the signs somewhere else? These are great and can't thank you enough. So here is my way of using your signs. Instead of framing them like I wanted to, the creative side decided to take over me. So I downloaded photostage slideshow and inserted the pictures and between my set of pictures I inserted a few movie trailers and repeat with different trailers. I'll take that slideshow and put it in my digital photo frame and hopefully it'll work. First off, these images are awesome, thanks a ton! But I just wanted to share an option I discovered through walmart.com especially for those wanting several logos on one sign. Trying to decide between the gold and silver look myself, landscape or portrait. Lots of possibilities here for you guys to try out. It is $15.86 for a 20" x 30" poster and the prices go down from there for smaller sizes. 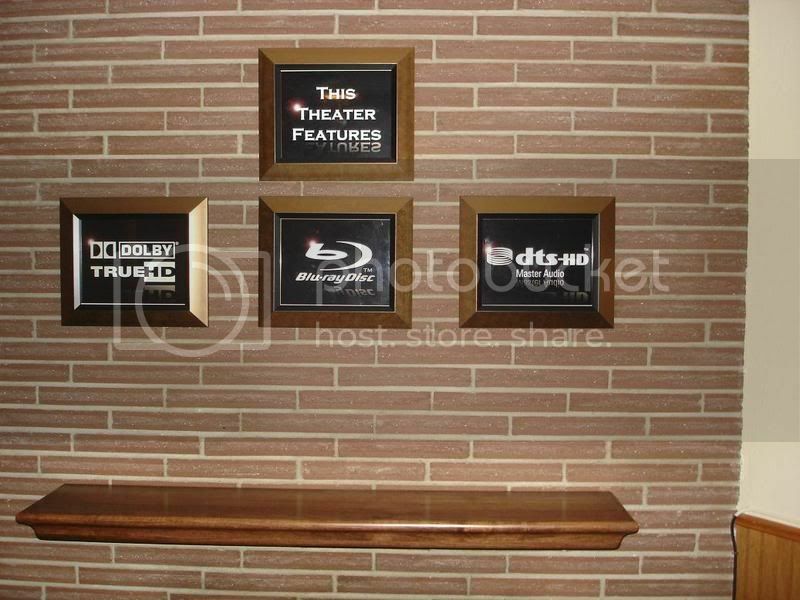 I'm going to take the plunge and order one of these, so I'll let you guys know about the quality. I think it will turn out great. On another note, I'm mildy concerned that Walmart might shoot me down because of their copyright policy. I mean is it technically illegal to slap all these logos on there and print them off? I'm not worried about getting in trouble, just figure they might not fulfill my order per their copyright policy. We'll see. Here's a landscape layout I came up with. Problem is I can't decide which one to go with! Oh well, I tried. I found a place called snapfish.com that uses the EXACT same interface to upload your album and make a collage, but I don't even know if it is worth the effort since it takes a while to get the pics in the right order. You might try ordering the poster from the kiosk in the store... that might bypass the copyright check. I didn't have any problems having my 8x10s printed in the store, but anything bigger is sent out. These look Great. I will be jumping on board and donating and printing as well. That's what I figured. I also wondered what their system is to check - probably automated and it scanned and picked up on the copyright and trademark symbols on some of the logos. These were on the gold images, but they are not on the silver ones. I'm interested to see if I submitted a poster with the silver images if it would go through. If not, I guess I'm relegated to the 8x10s, which are nice, but I had my hopes up for this poster collage. I had a perfect one all laid out too.